Apple iTunes has lots of restrictions and is complicated for most users to use without tricks. It only supports limited files to back up or manage. That’s why most iOS users would like iPhone music transfer app for help. Third-party apps give you more control of your music as compared to iTunes. Getting an app to transfer music from computer to iPhone without iTunes will be of great help to see our music transfer without problems. As the best iPhone/iPod/iPad music transfer app, iMyFone TunesMate is your one-shop solution to transfer music files for your iDevice in one convenient place. It does not require iTunes for all iOS related features. Apart from music, iMyFone iPhone Music Transfer app free also supports movies, playlist, photos, iTunes U, podcasts, audiobooks, TV shows, etc. iMyFone iPhone music transfer app is highly spoken of by hundreds of well-known media, like Geekreply, tricksworldzz.com, etc. Two-Way Transfer - Freely transfer music between iPhone and computer without deleting old music files. Back up & Restore - Back up iPhone music to computer/iTunes/external hard drive/MP3 player, etc. and restore backup without data loss. Share Music - Share your iPhone/iTunes music to different Apple IDs. Paid & Free Music - Music purchased from iTunes, Google, Amazon music, and also free music are supported to transfer. Repair Corrupted iTunes Music Library - When your iTunes library damaged, or you mistakenly delete music, you can easily restore the music library with TunesMate. So How Can We Transfer Music from iPhone to Computer? Download the free trial of iMyFone iPhone music app and follow below to try. Step 1: Connect your iPhone to computer and launch TunesMate. Step 2: Go to “Music” at the top and you will be in “Music” category by default. 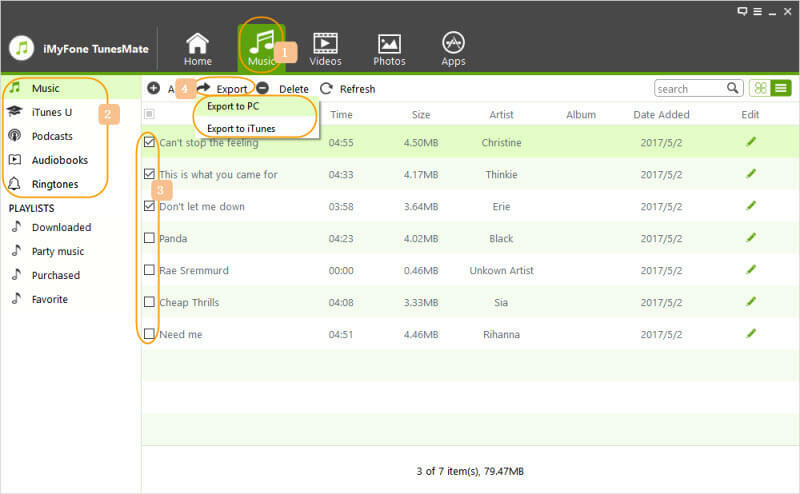 Step 3: Select some songs and click “Export > Export to PC”. Step 4: choose the target folder on computer to save them. Hit “OK” to start the process. It is a helpful tool when you need to transfer music/video between iPhone and computer. With iTunes, it said it would erase my iPhone. But with this tool, it added the videos I needed without erasing. iMyFone TunesMate is a great iTunes alternative which works great to transfer music between iPhone and computer freely. Featuring with an automatic converter, incompatible music will be automatically converted when transferring. AnyTrans is an app to transfer music from iPhone/iPad/iPod to computer or iTunes and vice versa. It is getting famous as it is easy to use. You can transfer more songs to your iPhone directly from computer. It can rebuild your music library and provide easy connectivity with multiple iDevices. All these make it more reliable than iTunes. It just requires a few steps to make it. It can transfer music from iPhone to computer, or from computer to iPhone. 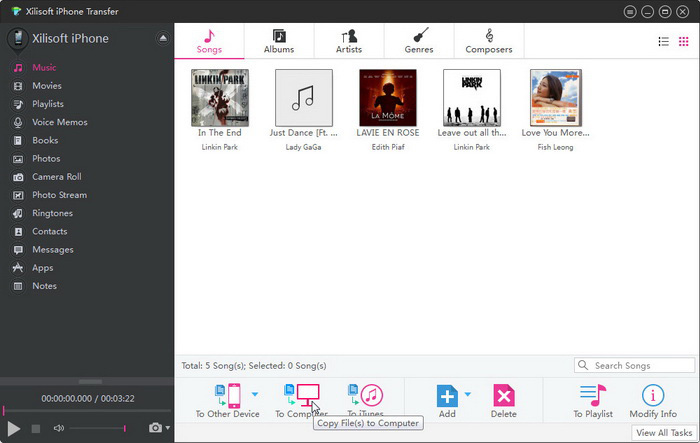 It allows you to manage your music library with easy tips. You can transfer non-purchased music to/from iPhone/iPod/iPad. AnyTrans is one of the best iTunes alternatives hands down. If you are looking for iPhone management software for your computer then AnyTrans should be your first choice. PodTrans is as its name shows, iPod music transfer app. Of course, it also works for your iPhone and iPad. It is an app to transfer music from iPod to iTunes and vice versa. 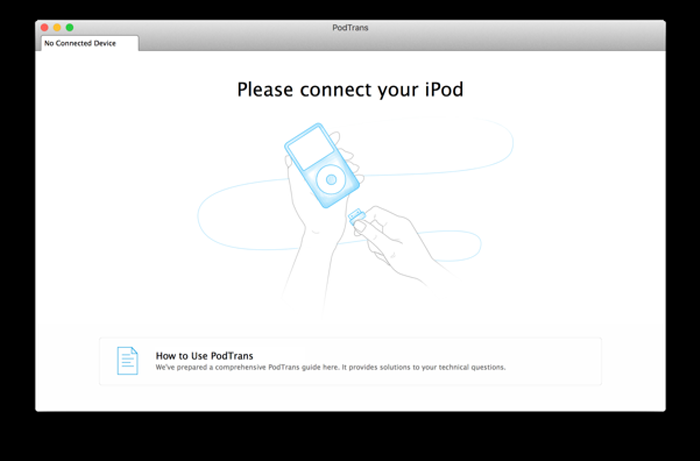 Of course, you can easily transfer your music or media files from iPod to computer. It provides you with 1-click process so that you can make it easily. It provides easy ways to import and export music files between iPod and computer. You can back up and restore data. You can transfer music between iPhone/iPod and computer/iTunes. No reviews are found for PodTrans Music transfer app. SynciOS is a great music transfer app iPhone/iPod/iPad that you can download all kinds of music or the whole playlist. It gives you much assistance to manage your music. Of course, you can transfer your music from your iPod/iPhone/iPad to iTunes library without iTunes. If you want to know more about SynciOS tool, just read the full review of SynciOS Music Transfer. It helps you to import or export music file to/from iOS device. It helps you to back up files on computer for future need. 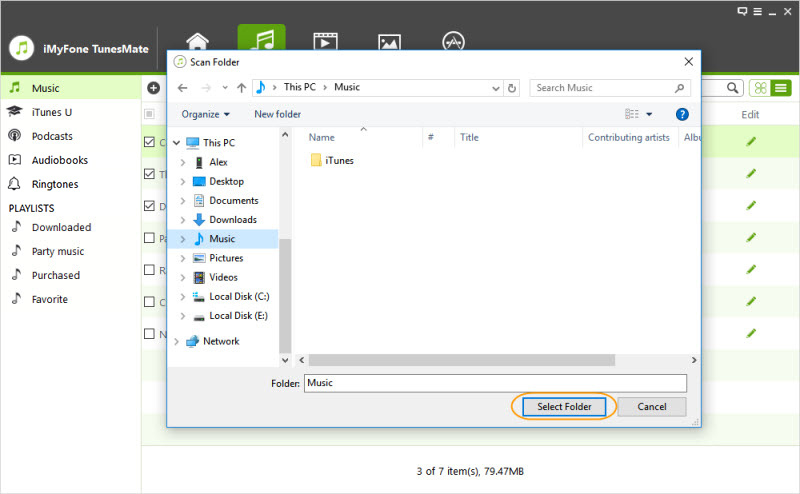 Apart from adding music files, you can also delete unwanted music files in bulk. 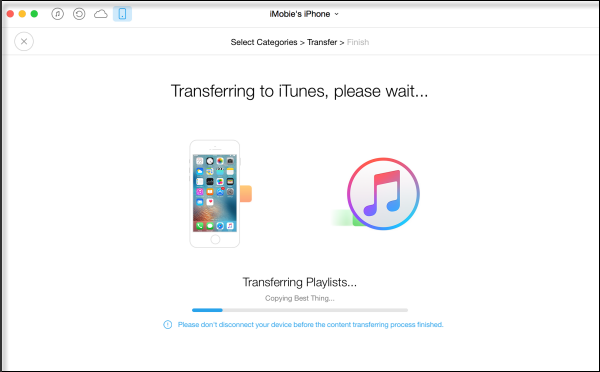 Xilisoft iPhone Transfer is a smart app to transfer music from iPhone to Windows or Mac. Not only working as a transfer app, it is also an ideal iDevice manager to back up music and other media files to iTunes. You can also copy items from your computer to iPhone. It can imports files to iOS device from computer. It can synchronize music on iPhone/iPad/iPod to iTunes library. You can manage iPhone music, videos, movies, audiobooks, photos, etc. No reviews are found for Xilisoft iPhone Music Transfer.